FC Barcelona defeat Cultural Leonesa 1-0 to kick off Copa campaign. 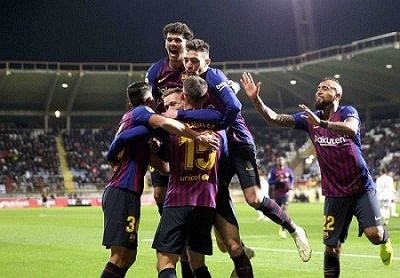 FC Barcelona kicked off their quest to win their fifth consecutive Copa del Rey crown with a scrappy 1-0 away win over third-division Cultural Leonesa in late fashion. The 30-time Copa del Rey champions were minus many key starters but managed to keep a clean sheet thanks to some superb saves from Jasper Cillessen. It appeared that the game was heading towards a scoreless draw until Lenglet managed to head down Dembele’s free kick for the game winner in stoppage time. The Blaugrana will enjoy a one goal lead when they host Cultural Leonesa for the second in early December. Barça will now shift their attention to league play when they travel on Saturday to Madrid to face Rayo Vallecano. Cultural Leonesa: Palatsí, Saúl (José Alonso, min. 76), Iván González (c), Vicente (Toño, min. 59), Nicho, Jesús Bernal, Sergio Marcos, Liberto, Zelu (Hugo Rodríguez, min. 68), Jorge Ortiz & Aridane. FC Barcelona: Cillessen, Semedo, Chumi, Cuenca (Lenglet, min. 60), Miranda, Samper (Aleñá, min, 32), Arturo Vidal, Denis Suárez (c), Malcom (Arthur, min. 79), Dembélé & Munir. Goals: 0-1, Lenglet (min. 90+1). Cautions: Saúl (min. 25), Miranda (min. 40), Nicho (min. 52), Ernesto Valverde (min. 78), Palatsí (min. 81), Ortiz (min. 82), Iván González (min. 89). Red Cards: Sergio Marcos (min. 90+4 y 90+4). Next PostBarça fight back to defeat Rayo Vallecano 3-2.